This is also the title of a well-established science meeting which we hosted at IAP on 18–22 September 2017. Special issues from former LPMR meetings were mainly published in JASTP, but for various reasons we prefer ACP this time. The special issue arises from the LPMR meeting, but it should be open for all submissions within its scope. The main science topics covered during the LPMR meeting are as follows: 1. 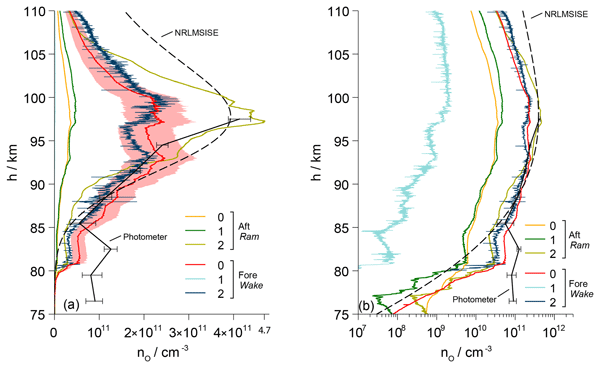 Mesospheric phenomena and related sciences, including noctilucent clouds (NLCs), polar mesospheric clouds (PMCs), and polar mesospheric summer echoes (PMSEs). 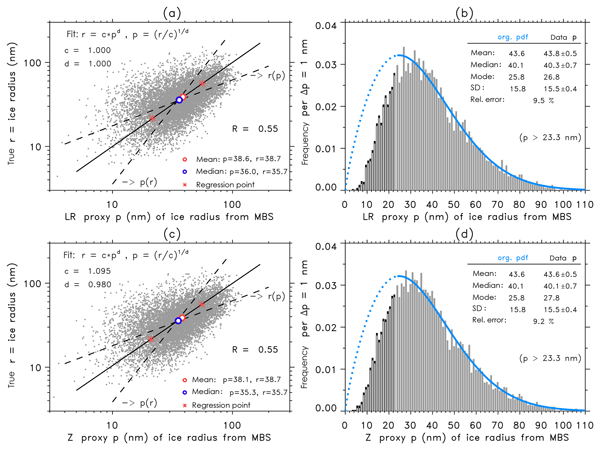 Measurements of these ice layers and related parameters by modern technologies such as lidars, radars, imagers, interferometers, spectrometers, rocket-borne sensors, and satellite-borne instruments, e.g. on AIM. 2. 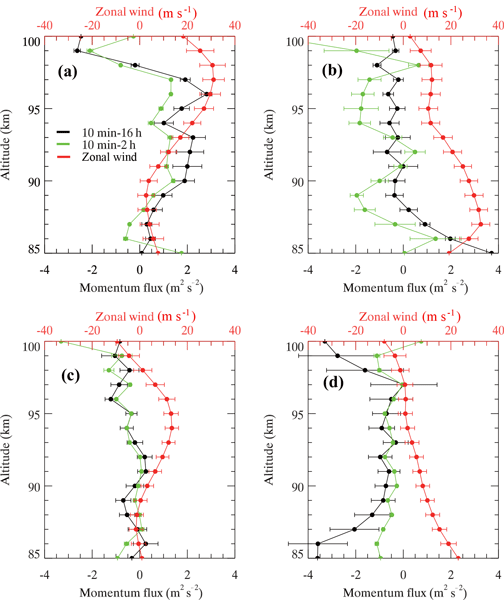 Long-term trends and solar-cycle-induced variations of layered phenomena and the role of these ice layers in the study of climate change in the middle atmosphere. 3. Neutral and ionized metal layers of meteoric origin and related parameters such as cosmic dust, meteors, meteoroids, meteorites, and ablation physics. 4. 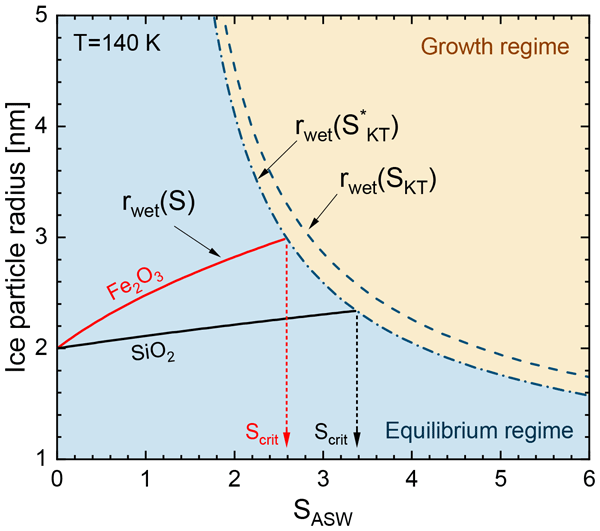 The physics and application of airglow to study the thermal and dynamical structure in the mesopause region. 5. 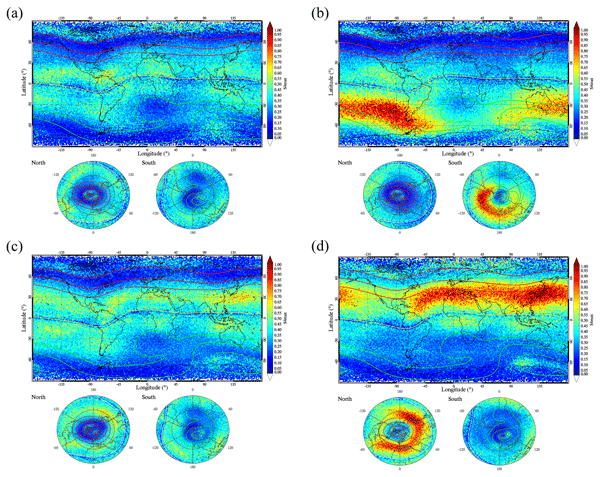 Using layered phenomena in the mesopause region as tracers to study gravity waves and turbulence. 6. Related atmospheric phenomena such as ionospheric layers and dynamic coupling between atmospheric layers. 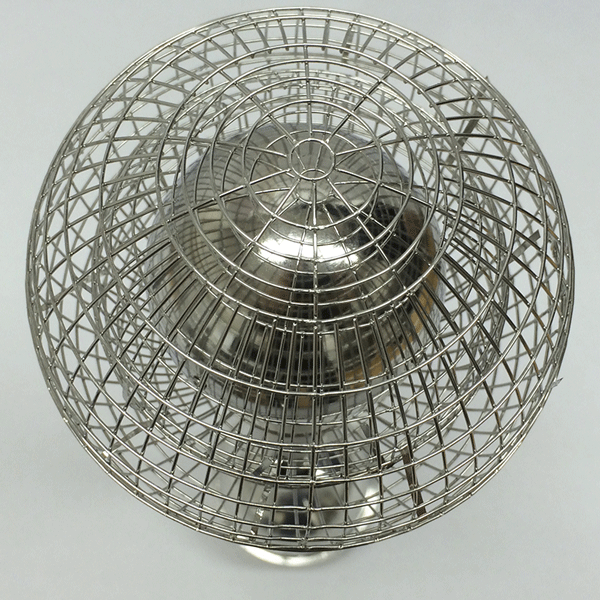 We present a new method of analyzing data from rocket-borne aerosol detectors of the Faraday cup type (DUSTY). 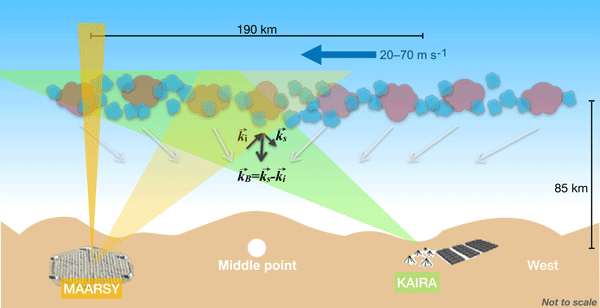 By using models for how aerosols are charged in the mesosphere and how they interact in a collision with the probes, fundamental parameters like aerosol radius, charge, and number density can be derived. The resolution can be down to ~ 10 cm, which is much lower than other available methods. The theory is furthermore used to analyze DUSTY data from the 2016 rocket campaign MAXIDUSTY. 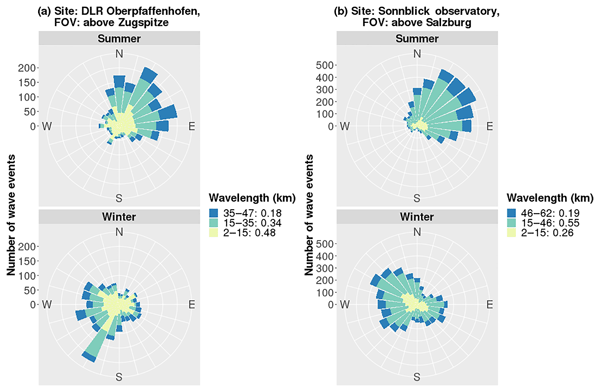 Using 11 years of lidar temperature data, the seasonal variations (SVs) of gravity waves (GWs) are addressed in the tropical mesopause region, shown to be clearly associated with the SVs of zonal winds reported in the literature. The SVs of GWs are determined by the filtering effect of the local background wind. 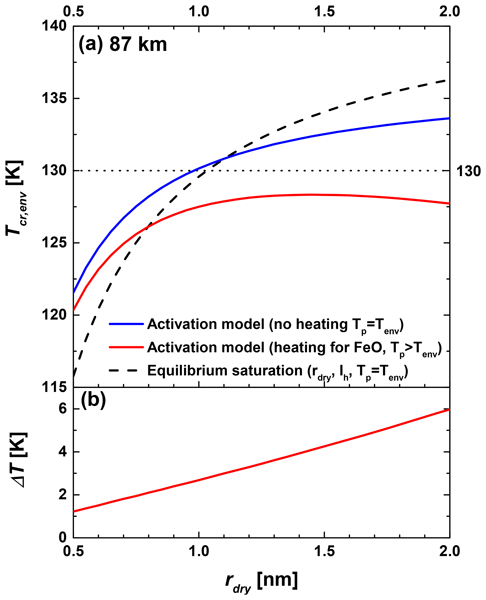 The altitudes of GW potential energy have a close relation to the upper mesospheric temperature inversion layers (TILs), which provides support for the formation mechanism of TILs. Light emission from energetic hydroxyl radical, OH*, is a prominent feature in spectra of the night sky. It is routinely used to determine the temperature of the atmosphere near 90 km. 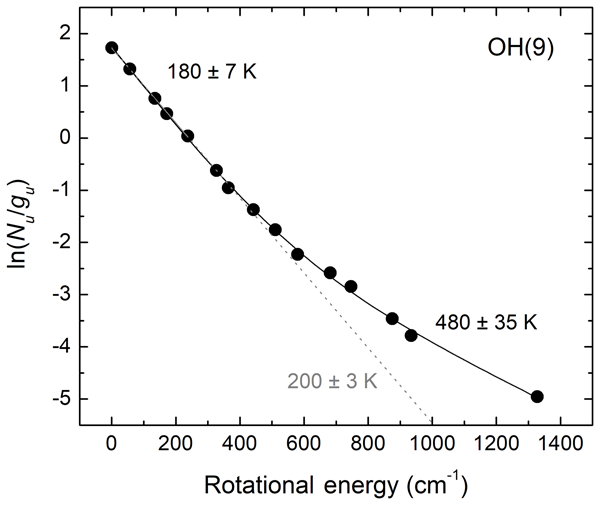 This note shows that the common practice of using only a few emission features from low rotational excitation to determine rotational temperatures does not account for the bimodality of the OH population distributions and can lead to large systematic errors. Sounding rockets are the only mean of measuring small-scale structures (i.e. spatial scales of kilometers to centimeters) in the Earth's middle atmosphere (50–120 km). 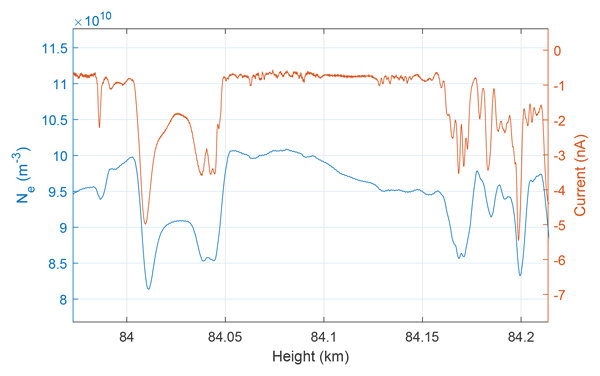 We present and analyze brand-new high resolution measurements of atomic oxygen (O) concentration together with high resolution measurements of ionospheric plasma and neutral air parameters. We found a new behavior of the O inside turbulent layers, which might be essential to adequately model weather and climate. 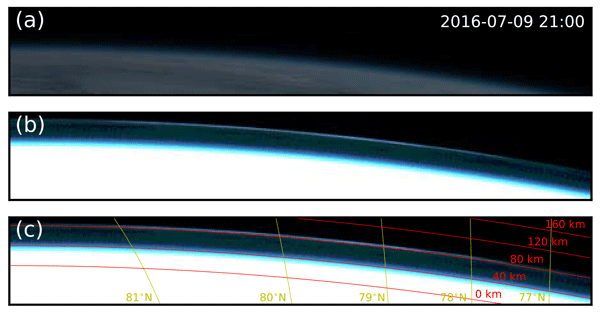 Combining satellite observations of Polar Mesospheric Clouds are complicated due to satellite geometry and measurement technique. 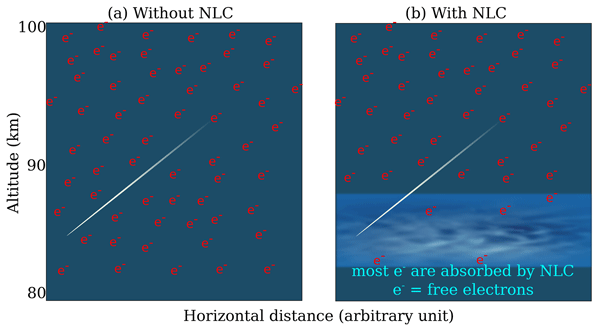 In this study, tomographic limb observations are compared to observations from a nadir viewing satellite using a common volume approach. We present a technique that overcomes differences in scattering conditions and observation geometry. The satellites show excellent agreement, which lays the basis for future insights into horizontal and vertical cloud processes. Atmospheric waves are important as they can link together conditions over large distances. MATS is a new Swedish satellite to be launched in 2019 that will study waves at altitudes around 80–110 km. MATS will take images of emissions from excited molecules, so-called airglow, and of the highest clouds in our atmosphere, so-called noctilucent clouds. These measurements will be analysed to provide three-dimensional wave structures, and these can then be related to other atmospheric altitudes. 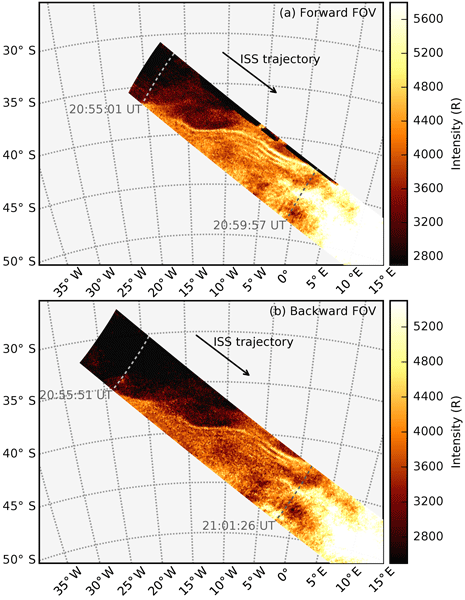 We have extended our 40-year satellite data record of polar mesospheric cloud (PMC) behavior by adding data from a new instrument. Long-term trends in PMC ice water content derived from this record are smaller since 1998 compared to the first part of our data record. 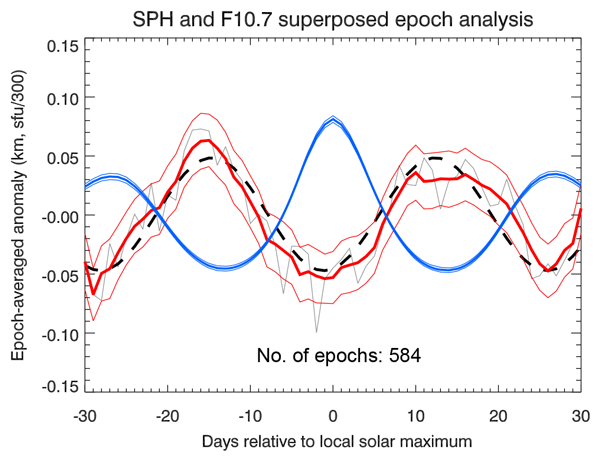 The PMC response to solar activity has decreased in the Northern Hemisphere but increased in the Southern Hemisphere, for reasons that are not understood. The seasonal variations in the mesopause densities, especially with regard to its global structure are still unclear. 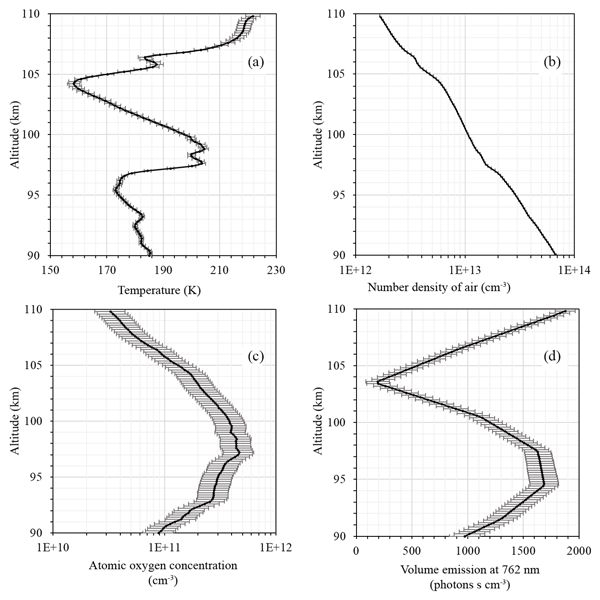 In this study, we report the climatology of the mesopause density estimated using multiyear observations from nine meteor radars from Arctic to Antarctic latitudes. 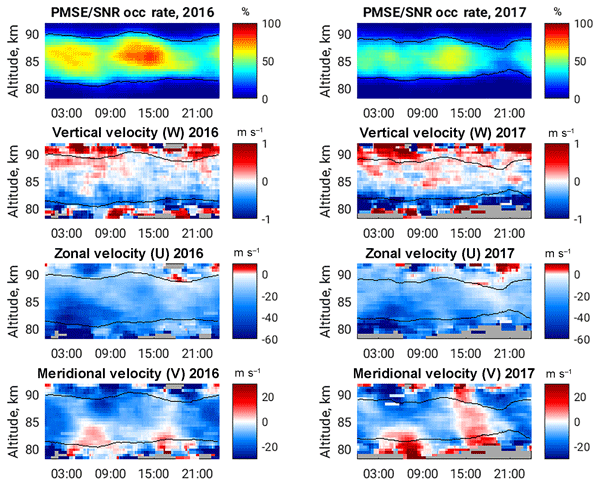 The results reveal an significant AO and SAO in mesopause density, an asymmetry between the two polar regions and evidence of intra-seasonal oscillations, perhaps associated with the ISOs of the troposphere. Polar mesospheric clouds (PMCs) or noctilucent clouds (NLCs) are the highest clouds in the Earth's atmosphere. In this paper, we introduce new PMC observations by the Japanese Geostationary Earth Orbit (GEO) meteorological satellite Himawari-8, which was launched in October 2014. Ice particles of noctilucent clouds (NLCs) are used as a tracer to investigate tidal signatures in the altitude range from 80 to 90 km. 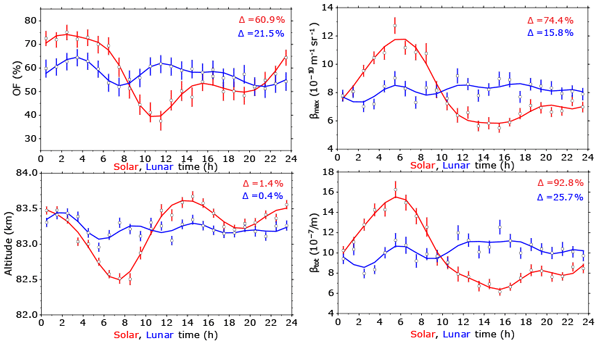 For the first time solar and lunar tidal parameters in NLCs were determined simultaneously from the same data set. 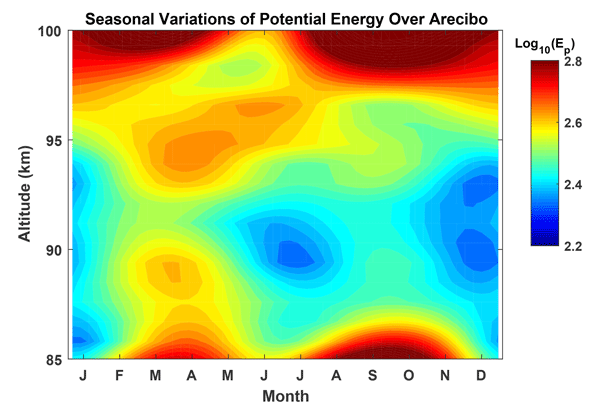 Solar variations are dominated by diurnal and semidiurnal tidal components. 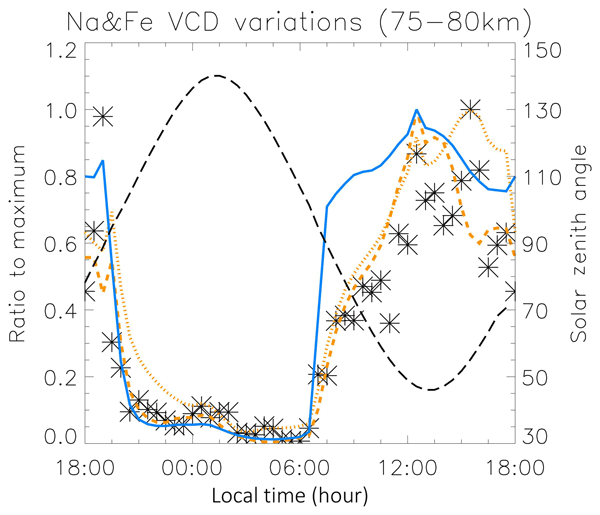 For NLC occurrence the lunar semidiurnal amplitude is approx. 50 % of the solar semidiurnal amplitude. Phases of solar components indicate upward propagating tides. Meteoric ablation creates layers of metal atoms in the atmosphere around 90 km. Although Ca and Na have similar elemental abundances in most minerals found in the solar system, surprisingly the Ca abundance in the atmosphere is less than 1 % that of Na. 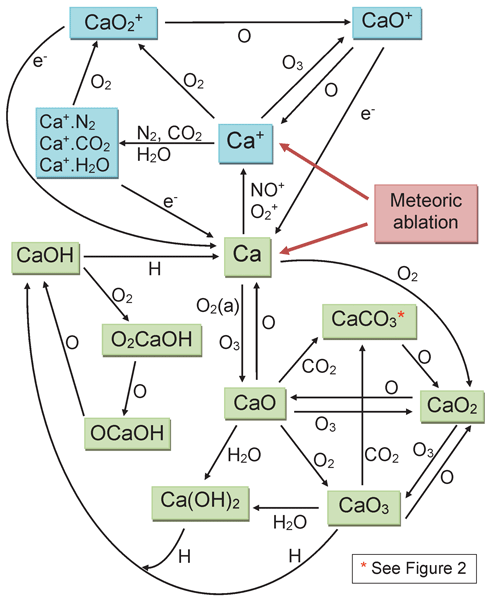 This study uses a detailed chemistry model of Ca, largely based on laboratory kinetics measurements, in a whole-atmosphere model to show that the depletion is caused by inefficient ablation of Ca and the formation of stable molecular reservoirs. Energetic photons, such as ultraviolet light, are able to eject electrons from a material surface, thus creating an electrical current, also called a photocurrent. A proper estimation of this photocurrent can be crucial for space- or rocket-borne particle detectors, as it can dominate over the currents that are of scientific interest (induced by charged particles, for example). This article outlines the design for photocurrent modelling and for experimental confirmation in a laboratory. 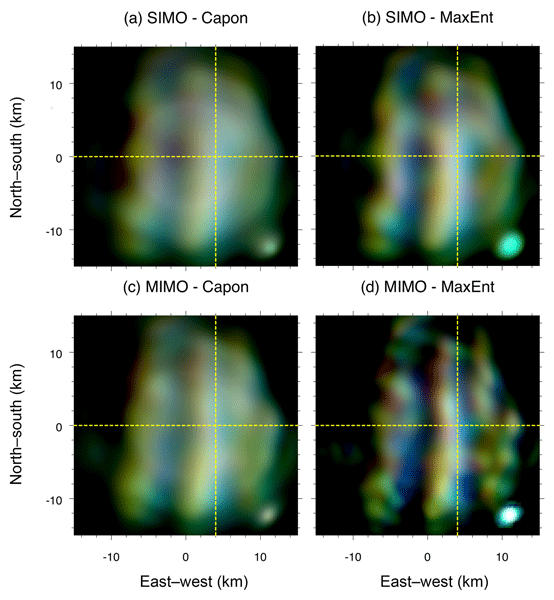 Combining a phased-array power radar and a phased-array radio telescope, we have been able to identify and characterized horizontal structures and movement of noctilucent clouds, but at 3 m scales instead of optical scales. As a byproduct of our observations, we have studied their angular dependence. We show a new alternative to study these clouds on routine basis and therefore study the atmospheric dynamics that modulate them.